Elegant holder in damask, hand-made in Italy exclusively for Fondazione Musei Civici di Venezia. This small pouch has the perfect size to pop into your handbag and is easy to spot amongst your packing, ideal for storing your travel-size beauty essentials or stationery. 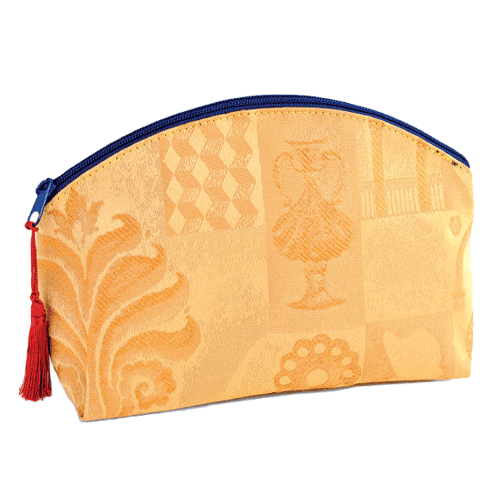 This stylish toiletry bag is inspired by the Doge’s Palace, the Fortuny Museum, the Museo Correr and all the other unique Civic Museums of Venice, made by precious damask where the architecture, the lion, the doge, the gondolas, all the symbols of the magic and splendour of Venice take shape.